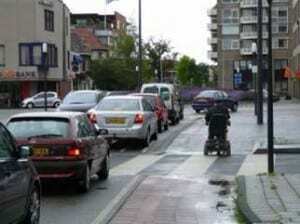 The WWBPA is slowly making progress on improving the accessibility of sidewalks and crosswalks. Some work has already started or is in the capital budget and should be completed this fiscal year, so by June 30. Such improvements, particularly those affecting access between township properties, such as the Municipal Complex and parks, transportation and businesses, are not only obvious but in many cases are required under the Americans with Disabilities Act, or ADA. These improvements make a huge difference not only to people like Michael Ogg, a WWBPA trustee and a wheelchair user for several years, and other people with disabilities, but also to the general public: those pushing strollers, the elderly, young children on bicycles. But what about a trail that goes nowhere? A trail whose purpose is simply to allow its users to enjoy the outdoors or to explore the woods? 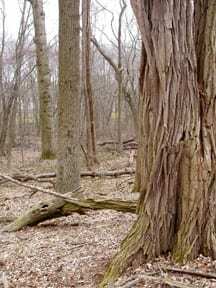 Yes, there are trails around Community Park and the Ron Rogers Arboretum, certainly the Trolley Line Trail, but not in the woods. 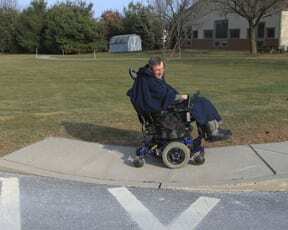 West Windsor is fortunate to have so much open space, but shouldn’t people who use wheelchairs also be able to enjoy it? The WWBPA thinks so and is exploring with Friends of West Windsor Open Space the possibility of creating an accessible trail. 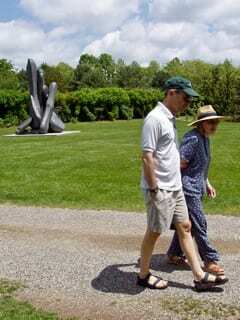 A good candidate location is in the woods adjacent to the Ron Rogers Arboretum with a trailhead at the “hat” memorial. A suitable surface is boardwalk or crushed stone: solid enough for wheels but still permeable and environmentally appropriate. Tell us what you think about this. Hamilton is in the middle of a review of its master plan, a long-term vision for planning and development. 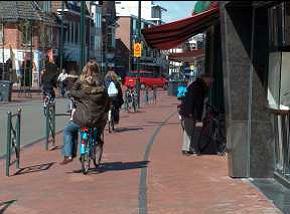 One goal is to add more bicycle and pedestrian paths. The workshops on the master plan are continuing; this is the time for residents to make their views known. You can read more about what’s happened so far here. It’s encouraging to see more New Jersey communities (Newark, Hoboken, Freehold …) are looking at infrastructure improvements for bicyclists. Here’s the latest on what we’ve read about Hoboken (and Jersey City). Comments Off on A Friendlier Hamilton? 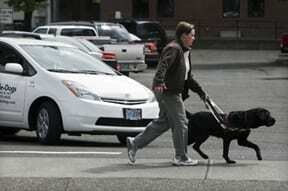 Saylor, a guide dog, pulls trainer Sioux Strong out of the path of a Prius during a training session. Washington, D.C. (December 10, 2010): The National Federation of the Blind today commended the United States Senate for passing the Pedestrian Safety Enhancement Act (S. 841), which will protect the blind and other pedestrians from injury as a result of silent vehicle technology. Because blind pedestrians cannot locate and evaluate traffic using their vision, they must listen to traffic to discern its speed, direction, and other attributes in order to travel safely and independently. Other people, including pedestrians who are not blind, bicyclists, runners, and small children, also benefit from hearing the sound of vehicle engines. New vehicles that employ hybrid or electric engine technology can be silent, rendering them extremely dangerous in situations where vehicles and pedestrians come into proximity with each other. The House of Representatives passed the legislation on December 16, 2010. President Obama signed the legislation on January 4, 2011. The revitalization of the Acme shopping center (really called Windsor Plaza) is crucial to the health of Downtown Princeton Junction. And all plans that call for a town center or village center there and have been endorsed by over the past couple of decades have included a path through the woods to serve as a safe, off-road route to the train station for pedestrians and bicyclists. The current plan for the path, contained in the Redevelopment Plan, is from the back of the shopping center to Borosko Place. The new owner of site, Irv Cyzner, and the current Planning Board, don’t seem to want that path (read the Princeton Packet article, “Planners stay ruling on Czyner). But many residents support a trail. Mr. Cyzner’s plans remain before the planning board, and a fourth public hearing on his proposals, this time to discuss a variance on the size of the shopping-center sign, is scheduled for 7 p.m. Wednesday, January 12 at the Municipal Center. This is our last chance before the planning board vote to voice our support for this vital bicycle and pedestrian link. Please come show your support. A small number of bicycle lockers are available for rent at the Princeton Junction train station. These lockers are on the westbound side, along the Dinky tracks. Cost is $90 per year, payable every six months. The lockers are administered by Greater Mercer Transportation Management Association, 609-452-1491. Lockers and bike racks were added this year in a project jointly funded by the WWBPA, GMTMA, BikeFest and West Windsor Parking Authority, with racks and lockers supplied by New Jersey Transit and with installation assistance from West Windsor’s public works department. 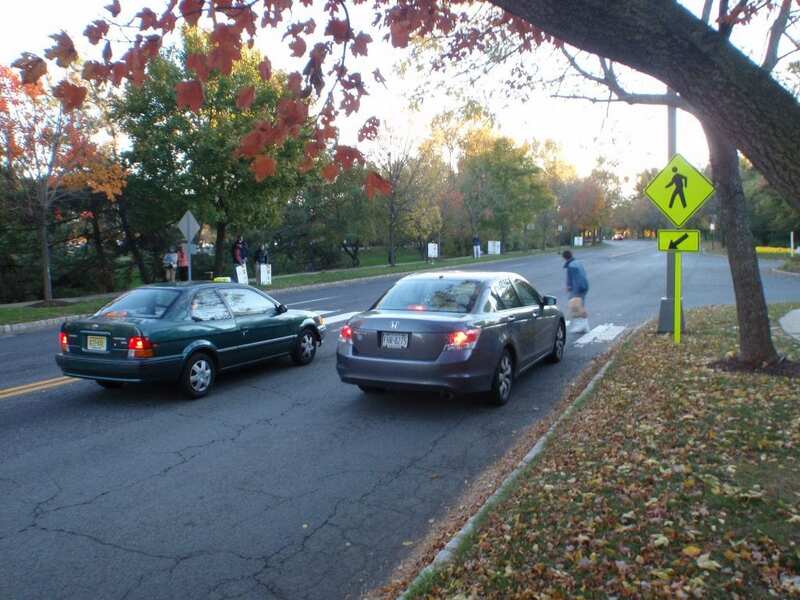 In 2009, 27% of fatal crashes in New Jersey involved pedestrians. 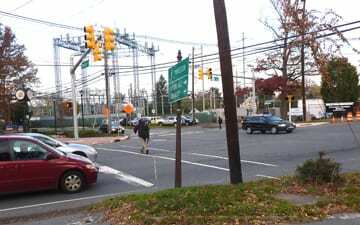 Since 1999, New Jersey pedestrian fatalities have remained steady at about 150/year. Since 2005, pedestrian injuries have ranged between about 5,000 and 6,000 statewide. In Mercer County, 171 people were injured in 2009. These are some statistics from a presentation by Gary Poedubicky, Acting Director of the NJ Division of Highway Traffic Safety, to the New Jersey State League of Municipalities in November 2010. 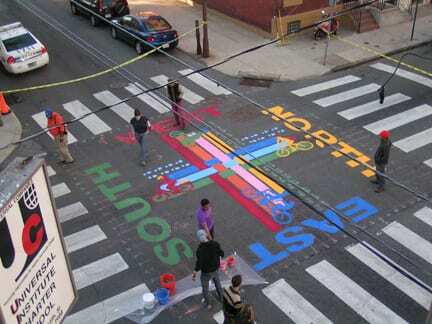 Most pedestrian fatalities occur away from intersections, on roadways without crosswalks. Approximately 40% of fatalities occur between 3:00 p.m. and 7:00 p.m. Most pedestrian fatalities occur in urban areas. More than two-thirds of 2009 pedestrian fatalities were male. Both pedestrians and motorists must do their part to keep pedestrians safe. 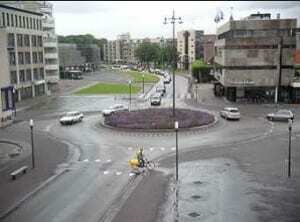 NJ law now mandates that motor vehicles stop and stay stopped for pedestrians in the crosswalk and at intersections. As well, pedestrians must take “due care,” and yield the right of way when not in a crosswalk. West Windsor Township has been awarded a Silver Certificate by Sustainable Jersey. SUSTAINABLE JERSEY ™ is a certification program for municipalities in New Jersey that want to go green, save money, and take steps to sustain their quality of life over the long term. So far, 67 New Jersey municipalities have been certified. As part of the Sustainability Actions, West Windsor Township Council passed Resolution 2009-R060 and the Township created a Green Team on which WWBPA President Jerry Foster serves as an advisor. Read the complete Sustainable Jersey West Windsor Profile. 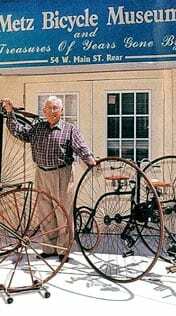 We think it’s also time for West Windsor to apply for Bicycle Friendly Community status from the League of American Bicyclists (LAB). Hoboken and Montclair were recently awarded honorable mentions. 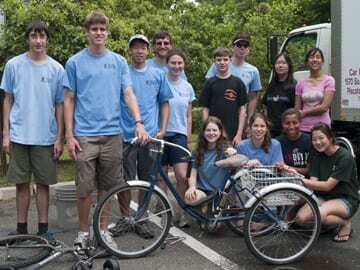 Two New Jersey towns are working on some big bicycle-friendly improvements. New Brunswick is close to building a 1.9-mile bikeway. As WalkBikeJersey explains, it should help residents of Highland Park reach the train station and will connect Rutgers’ Douglas campus with downtown, among other things. The bikeway will go from the intersection of Lafayette Street and College Avenue near the Route 18 John Lynch Bridge at its western terminus, to George Street and Bishop Street at the edge of the Douglas Campus to the east. 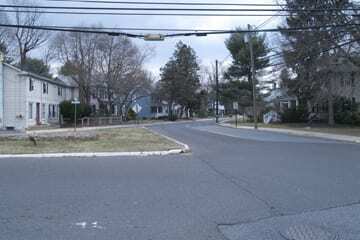 From Lafayette Street, the bikeway would run on College Avenue to Huntington Street, then down George St to Albany St (NJ Rt 27). At Albany, there will be a spur that will run south to the train station while the main route would head north to Neilson Street. Then the bikeway would head east along the entire length of Neilson Street to Bishop Street, where it will turn right for a few hundred feet back to George St. 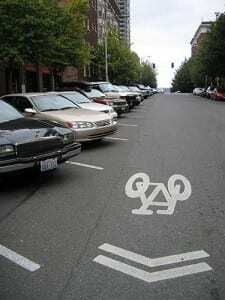 This is more than just paint on the road, and one feature will be on-street, contra-flow bike lanes. 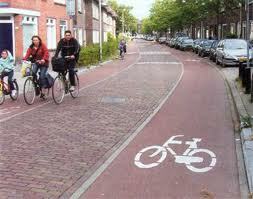 See BikeWalkJersey’s blog for more details. 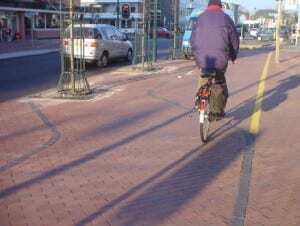 Hoboken is developing a bicycle and pedestrian master plan that includes narrowing extra-wide car lanes as a way to calm traffic and adding bike boxes, which put cyclists in front of cars at a red light for safety reasons. 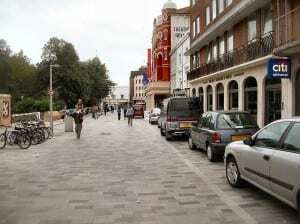 There also would be more police enforcement of speed limits and of laws requiring motorists to yield to pedestrians. The plan is now open to public comment. Read more on Streetsblog. 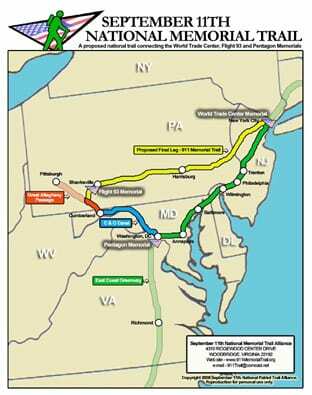 The WWBPA will be watching developments in both communities with interest and to see what might work in West Windsor. Finally, an idea from Pennsylvania that can be easily copied: writing to our elected officials in Trenton and Washington asking for effective legislation to ensure that those motorists who injure, maim or kill pedestrians and cyclists are properly punished. This letter notes that all too often, they don’t face criminal charges. 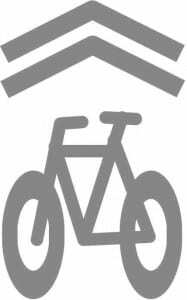 Make your voice heard in Trenton by signing an online petition here for a 3-Foot Safe Passing Law for New Jersey cyclists, walkers, runner, joggers and other vulnerable users. Read about the bill here. The coalition adds: The language isn’t perfect, but it is a beginning and a way to get the word out that all vulnerable users need to be protected. We also need to have a bill that will be passed and not continue to languish in committees. Please support the petition and your right to ride, walk, jog and run safely on New Jersey roadways.